Built to last and easy to transport, this commercial grade picnic table is ideal for year-round enjoyment. The expanded metal patches allow rain water to filter through to prevent puddles from forming on the surface. Easily convert this picnic table to a more permanent installation with the purchase of surface mount clamps or in-ground mount posts. 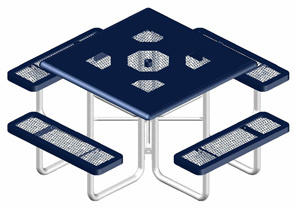 Table top is 46" square and comes standard with a 2-3/8" umbrella hole. Strong welded steel frame is powder-coated and will not warp, crack or peel. Your choice of bright colors to mix and match in a lightly textured Polyethylene finish top and seats. Umbrella and accessories sold separately. Expanded Metal Top & Seats.